On Tuesday 25th September we were very lucky to have a real paralympic athlete come to our whole school assembly and talk to us about her experiences. 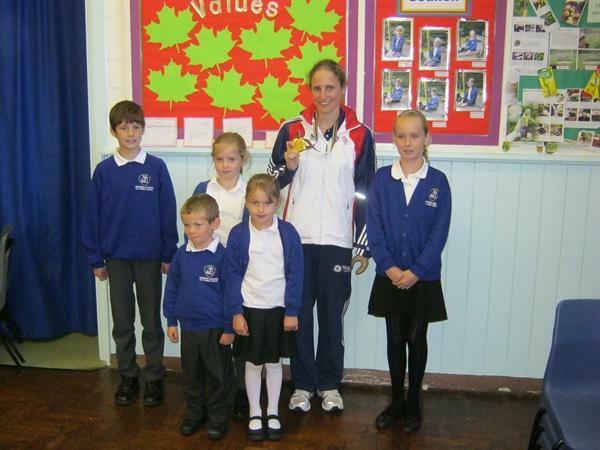 She told the children about how hard she had to train to achieve her goal of winning a gold medal in swimming, which she did at the Barcelona games. The children were very impressed with her achievements and perseverance. They loved being able to touch and see her gold and silver medals. Here are some of their reports written as homework. Also there is a photograph of her with some of the children from each class. She was a real inspiration!